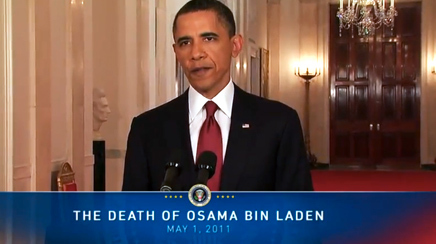 In a nationally televised news conference at about 11:40 pm EST on May 1, President Barack Obama announced Osama bin Laden had been killed at the hands of the US military. In a nationally televised news conference at about 11:40 pm EST on May 1, President Barack Obama announced Osama bin Laden had been killed at the hands of the US military. But unofficially the news broke more than an hour before, on Twitter, with the likes of Keith Urbahn, chief of staff for Donald Rumsfeld, saying they had heard the al-Qaeda leader had been killed. Twitter also proved a key communication channel for police departments in some major US cities, in the hours and days after the news was confirmed by President Obama. Driscoll says the tweet was re-tweeted dozens of times, and helped keep the celebrations, reportedly attended by thousands, without incident. The day following the announcement, the Department was also inundated with questions from media, particularly around security concerns given possible retaliation by al-Qaeda. It posted a video on YouTube, and on its blog and Facebook page, of Boston Police Commissioner Edward Davis talking about security. He encouraged the public to report suspicious activity to the Department, and to visit the Department blog to find out what kind of activity should be reported to police. “This allowed us to communicate an entire educational campaign prominently on our blog that explains to people, in a very simple way, what suspicious activity means,” says Driscoll. On May 1, the NYPD also used its Twitter account to issue a statement from Police Commissioner Raymond Kelly, in which he said Osama bin Laden's death “is a welcome milestone for the friends and families of those killed on 9/11.” The NYPD has just over 11,000 followers on Twitter. Follow-up tweets have focused on anti-terrorism security measures, including President Barack Obama's visit to Ground Zero on May 5, likely in an effort to reassure a nervous public. Officials at the NYPD were not immediately available for comment. Not every major police department, however, used social media to comment on the death of Osama bin Laden. “That's not a local police issue,” said Washington, DC Police Chief Cathy Lanier, in a statement to PRWeek. Lanier did several interviews with local media, including with the city's all-news radio station WTOP, said Gwendolyn Crump, the Department's director, office of communications.